The Megami Tensei series is a long one, and mostly a Japanese one. 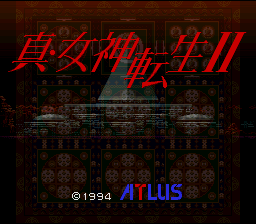 Shin Megami Tensei II is a direct sequel to Shin Megami Tensei, and takes place a few decades afterwards. You’re a guy who (of course) doesn’t know who he is, and he’s really strong and fights in the colosseum fights in Tokyo Millennium, a domed city that is essentially the last stronghold for humanity and whatnot. Soon he makes it to the championship battle, and shortly afterwards all hell breaks loose. LITERALLY! OMG hahahaha! You’ve never heard that one before, I warrant! All you people who don’t know what Megami Tensei is all about are pretty much cocking their head to one side and looking confused right about now. Maybe some further explanation is in order. I guess. The Shin Megami Tensei games take place in the distant future, where demons run rampant on the earth. Your advantage is your ability to talk to these demons and gain their trust. Ideally, they will join your party, and will fight alongside you and so forth. You can even fuse two or three demons to create an even more powerful demon. Pretty open-ended stuff, this. Fans of the first Shin Megami Tensei will not find much different. Thank Jesus, accessing the map now only requires a press of the L button. And there are… other differences.